WHTMScott Dunn graduating from East Juniata High School. The class of 2016 at Pennsylvania’s East Juniata High School just graduated for a second time. It was all part of a heartwarming plan for one senior named Scott Dunn, WHTM reports. Dunn was driving to a track meet a few days before graduation when he lost control of his vehicle and suffered major injuries in a crash. Doctors kept him in a medically induced coma for several days following the accident. 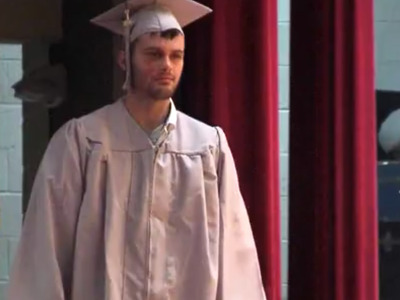 A few days later, the school’s principal contacted the family, saying that the senior class wanted to redo their graduation ceremony, giving Dunn a chance to experience the ceremony he’d missed. Last Tuesday, more than half of the graduating class returned to the auditorium, fully decked out in caps and gowns, to cheer Dunn as he walked across the stage and received his diploma. Dunn told WHTM that he’s focused on making a full recovery before he decides on his next step.